Is permanent or contracting work better for me? Should I switch to being a full-time employee? What are the benefits of being a contractor? Which one pays better? These are questions I ask myself from time to time. Having worked in both permanent and contract positions I have developed a more holistic view on the subject. You should definitely think of both sides before starting your career or moving on to another job. We all know what a permanent role is. Go to work, spend 40h per week, get paid by your employer no matter what. Be good at your job, start managing the junior ones, climb the ladder, get a pay rise – and that’s great. We often think of the permanent role as the only option though. So, what else is out there? Contracting is slightly different. Instead of being part of the company, you operate as an independent professional that provides your service to the company. Usually, a fixed-term contract contains all this info, including the contract period (3, 6, 12 months). Hence the word, contractor. Contractors operate through their limited company in a business-to-business fashion. One can, however, operate via an umbrella company, which saves the hassle at an extra cost. Enough with the introductions, let’s get to the point! Permanent or contract work? Which is better? Well, there are pros and cons on both sides. As with everything in life, it depends on what you want! I still remember the peace of mind I had when working as a full-time employee. Indeed, job security is the top reason I’d choose a permanent role for. It is quite hard for a company to fire you unless you do something stupid. When I say stupid I mean really stupid, like leaking company documents or installing a virus on purpose. Even if you’re laid off because of restructuring or something, you’ll usually receive a generous compensation in return. My friend who Microsoft laid off, for example, received £20,000 as a goodbye letter. With contracting, on the other hand, expect to be looking for another gig in X months. That’s the nature of the business. Serving as part of their temporary workforce, companies want to have the flexibility to scale up and down according to their needs. As a permanent member of the company, you’re entitled to higher positions via promotions. 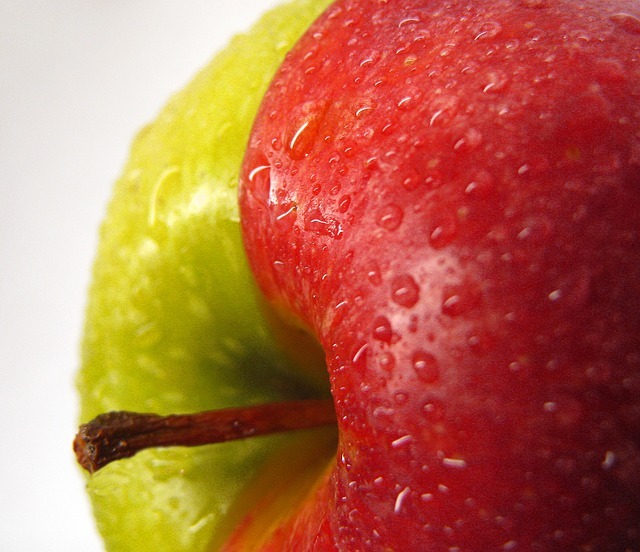 Whether you’ll be the next CEO or stuck in the same position for 20 years is up to you! Nevertheless, you enjoy the benefits of a higher salary every now and then, managing teams and more junior people. Speaking at company events, representing the brand as an expert at conferences and generally taking credit! This is very highly appreciated by some people. The sense of reward for you and your team when reporting to the person above you and leading the people below you. It can go either way, so taking accountability on failures is part of the game too. Contractors also do get the sense of recognition when they complete a project or the same company acknowledges their value by renewing their contract or increasing their rate. There’s definitely recognition but no promotions unless you move to a more senior contracting role elsewhere. If you want to climb the ladder contracting is not gonna cut it at the management level. That’s not to say that as a contractor you cannot progress your career. Usually, contractors are quite skilled technically, because they have to! You level up faster because you find yourself always out of your comfort zone. This is because you develop more skills when switching to different environments compared to someone in the same culture/company skill set all the time. As a contractor, you are forced to learn new things and adapt or change the practices. You cannot ask for a high rate unless you’re great at what you do. As a contractor, you have no choice. You need to go to meet ups, attend conferences, have a blog, and prove your value every single day. Sometimes, as a full-time employee, you relax, enjoy the ride and do nothing to advance your skill set. You know that by the end of the month the paycheck will arrive – happy days! As a contractor, you have no choice. You need to go to meet ups, attend conferences, have a blog, and prove your value every single day. 3. Does Contracting or Permanent work pay better? Ok, let’s address the elephant in the room. Money. A benefit that contracting gives you is that you can charge more due to the fact you’re temporary. The company doesn’t have to pay any sickness benefits, any national insurance, any pension or vouchers for your child care! So if you’re present, you get paid. If you’re on holidays, sorry 0 pay. With that said, it’s not unusual to see the net amount of paycheck being 1.5x times or even double that of the full-time. However, all things considered, contracting is less good of a deal. It’s STILL a good deal though. 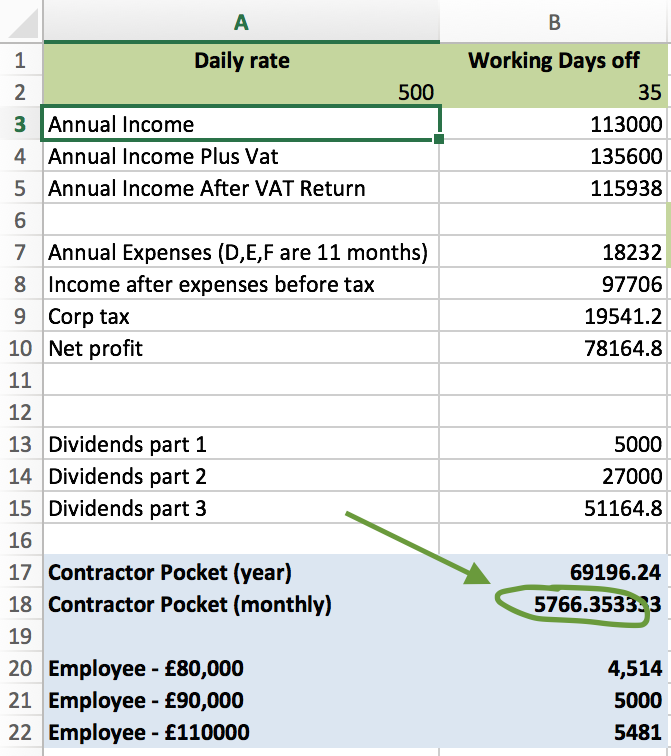 Contractor example – £500 per day, 7 weeks off (that’s 2 weeks off between contracts, 4 weeks holidays, 1-week off-sick), 5% pension, £1200 accountancy fees p.a. Ok, so annual take home £54,179 for the permanent position vs £69,196 for the contract one. That’s a £15,017 difference. And I’ve only calculated it the “dumb way”. I assumed that we take everything from the company every year and therefore pay the highest tax. I could only take home only what’s needed to cover our living costs and invest the pre-tax company money. You can also add more expenses to your company (i.e. your £2,000 new Macbook) which will make the pay gap even wider. But is this the full picture over the years? Try to convince my friend who got a £100,000 bonus last year. 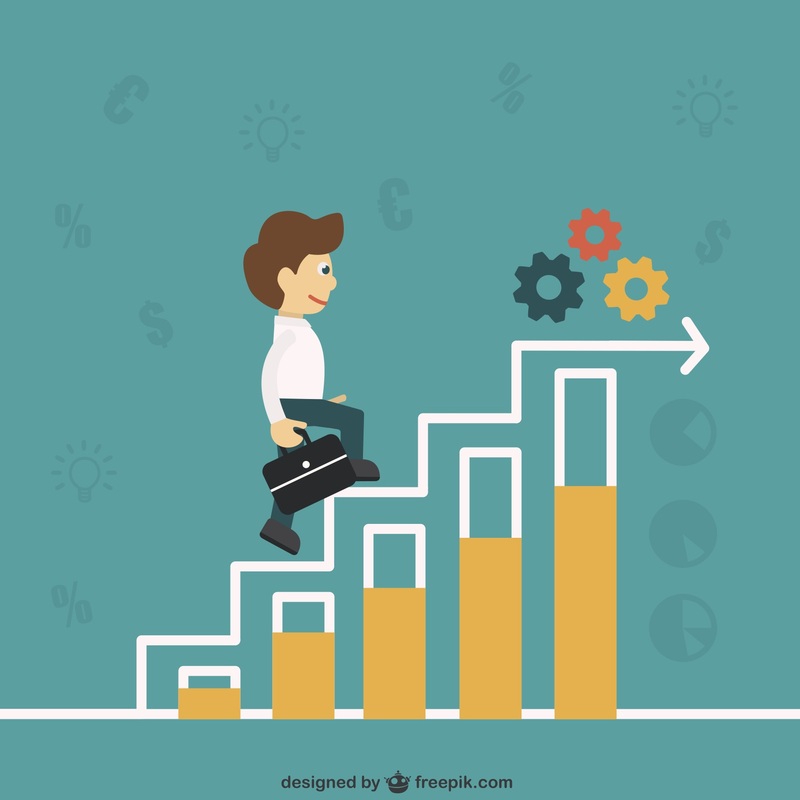 In reality, contracting will give you more money in the short term, but will not allow you to climb up the ladder and go for the big fish. As we saw in career progression above, it’s only with a permanent position that you can get the £200,000+ salaries in X years time. Contracting will give you more flexibility. You operate as an independent business and can even scale your team up or down, hire people and make it a proper business. Sometimes, you may want to take a 3-month holiday between contracts or want to work fewer days per week. If you are a free soul, don’t want to be tight into a company and hate politics then contracting is for you! There are many times I have seen people acting in a political way that would make me angry if I had been a permanent employee. As a contractor, you don’t really care about politics, as long as you deliver the tasks, get the hefty paycheck and move on to the next gig after a year or two. That’s the nature of the business. Moneywise, as we saw above, you will be better in the short term with contracting. Don’t expect a very high-income growth as you’d expect when getting high positions in companies. But thankfully, you may be already earning enough early on! In software engineering, for example, one can find a few very highly paid roles (£800 per day) at a software architect level. That’s A LOT of money! However, it takes a huge expertise and a strong network (hint) to get those roles. You need to market yourself too. You’re never bored! That’s actually one of the main reasons I love contracting. Don’t like the company culture or the team? Move to the next one. Don’t like the finance industry? Move to fashion, e-commerce, telecommunications etc. The world is your oyster! What about IR35? 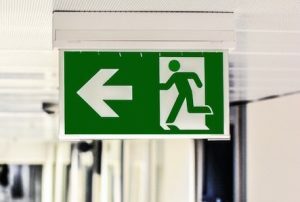 As if contracting wasn’t unstable enough, the UK government has introduced the IR35 legislation. That basically says that if you are a one-man band company then you need to pay same taxes as an employee. Same taxes without taking into account that as a contractor you’ll have to take the hit of finding new gigs, paying a pension, sickness benefits, void periods etc. Well, another government tax coming! Speaking of money, I enjoy using my IT business for buying new things the business needs. That can be anything, from gadgets (iPhone, tablets) to magazine subscriptions and travel expenses. That’s more money in the pocket and savings from your corporation tax! Contracting is not for everyone though. People starting out will be better off getting a junior perm position as they don’t have enough experience to position themselves as experts in one field. If you’re the type of guy that wants to climb up the ladder then definitely go for a full-time role. With contracting, you will (almost) never manage big teams or drive big changes across an entire organisation. You will be the expert people will consult but don’t expect to take any important strategic decisions etc. I just failed at an interview for a perm role which was high up the rankings. I asked for feedback as the interview process was a multi-step project. Why did I fail? I had the technical skills and my expertise was great, but I lacked the management and leadership abilities as I had never managed people before. Pick a permanent job and expect to take ownership. To see something grow whether that’s a team, a product or an entire company! That’s something magnificent that I’ve not experienced yet despite the 3 promising perm roles I’ve had in the past. Last but not least, brush up your interview skills! You should stay at a permanent position if you like stability. A contractor will be going through interviews and looking for a new job every year. Psychologically, that’s a burden. But if you have what it takes it will give you a boost. That of not being afraid to lose your job and also knowing what the market looks like. Permanent or contracting work? Which one will YOU choose? If you’ve read that far, congratulations! You’re really interested in choosing the right path for you. You have to take everything into account. Industry reputation, money, job security, career development, and generally what you feel like doing. I’m sure I might have missed a few points given I’ve only had 3 perm and 3 contract roles so far. That’s why I’d be very keen to find out what people prefer and why. Please DO let me know in the comments. Very interesting article and very timely as I repeatedly go over the same issue. Do you work directly as a software engineer? I’m guessing in London you find yourself mostly in finance roles? It’s a move I want to make in future but unfortunately Northern Ireland doesn’t have the largest contract market for my kind of position. I myself specialise in automated testing which has worked out well in terms of career progression. I’ve often been put into leadership positions but I’m not too sure it’s for me as you end up being removed from the craft and essentially just dealing with people exclusively. Switching so it’s all about the work I produce is VERY tempting, if we’re lucky enough to have good finances, I may do this so I can cut down on hours. That said, my friends contracting all seem to have abysmal roles except one guy. I also worked in banks in London and predominantly these systems are old beasts that have been made the most obscure spaghetti so contractors can stay on. What has your experience been like? Hi Nick! My experience has been good with contracting in London so far. I have been lucky enough not to work with very old systems, but have heard from people who have. It’s true that legacy systems can be a contractor’s nightmare but I’m trying to avoid that as much as I can. A legacy system will not progress your career either and will only make the next gig harder to find! London’s high rates are indeed mostly in the finance sector, but the rate doesn’t have to be very high for a contractor to earn good money. It’s positive the fact that you try to stay technical while maintaining some leadership. In my opinion tech jobs will never go out of business, but project managers, scrum masters etc are more fragile… I believe a tech architect contract is somewhere in the middle but also more rare to find! I especially agree with your comment: “In reality, contracting will give you more money in the short term, but will not allow you to climb up the ladder and go for the big fish”. However there is a thought spinning in my head. Do you think that contracting in IT is different than contracting in Finance? To my understanding IT will drive you either climbing up the ladder (career oriented) or contracting (money oriented). On the other hand contracting on Finance/Business roles may harm your CV. Maybe i am mistaken, but I think that contracting in a Bank, on a NON IT role will make others put an eye on you… In the end of the day an IT role should be filled by a contractor as the bank is a financial and not a tech institution, but a solely business/finance role should be perm as the knowledge should stay in the bank. I would like you to share your thoughts on this, because I am currently contracting in banking on a business role for the last couple of years and I wonder if this will be a drawback in my CV. Thanks for the great comment Nikos. To be honest, I’m not in the finance sector and cannot comment with certainty but it looks like a supply and demand problem to me. Let me explain. Because of the tech boom, there’s a higher demand for temporary workforce in IT which drives rates higher. Now there may be higher supply in the finance sector which makes contractors take less popular roles or boring positions. But regardless of the supply and demand, one will only harm their CV by taking contract roles that are totally opposite to what they want to do in the future. If the role is not aligned with your career goals and it’s just for the money then your CV won’t look good whether you’re in finance or IT. GOOD finance contracts may be harder to find compared to IT ones though. The argument that knowledge should stay in the company is a very important one that I didn’t mention… You’re right. But that’s what the company essentially pays for hiring someone that can do the job immediately rather than training the existing staff to the job. Again, I’m not entirely sure about the finance sector so if any readers know more, please enlighten us! A very good article in terms of content and pros vs cons etc. However I would say that the worked example is a little unrealistic in respect of the numbers. Firstly, 2 weeks off between contracts looks rather optimistic as a budget, to say the least! Admittedly I can only speak as an independent consultant and independent interim director / manager, but most of us budget for about 160 billable days / year, not 200 plus. Secondly (and this is the good news) if a ‘perm equivalent’ was being paid £80,000 / year, then as independents we wouldn’t be charging £500 / day, we’d be charging £800 / day. The widely used guideline for what you can reasonably expect to charge based on market forces, and get (and it seems to work in my experience), is that you charge a daily rate equal to 1% of the equivalent perm salary, hence £800 / day for the worked example, rather than £500. However as I said above it’s a great article and really highlights the pros and cons of each type of working life. Best wishes. Thank you Andrew! Interesting to see how different positions or industries look at the same question. I believe the higher the position the harder it gets to find consistent work. The price plays a role as well. I know an energy consultant who charges £2,000 per day but can only find work 2 days a week on average. Do you work on per project basis Andrew? My guess would be that you work with different clients every week. For software engineering contractors it is quite common to work 6-months straight for one client but for lower pay. Your Article is very interesting and I’ve learned a lot. That is very Great !! I am a French Graduated Mechanical Engineer and I am interested to work on the UK. First, I don’t really know the pay for a three-year experienced engineer in the UK… A Contractor Company is offering me a contract for 25 £ / hour, is this realistic ? It’s a 6 month contract in the automotive field and renewable. I don’t really have an experience of how it works in the UK so this is why I am looking for some advise. Hi Akif, contracts paying £25 per hour are real but of course, you have to do your research on the company as well as the recruiter company. Check reviews of the company on Glassdoor and do some Googling to find out whether other companies pay similar rates. Then you’ll know whether this is a legitimate role or not. Thank you Sudhir, I’m glad you liked the article. Excellent article matey and nice to see it all clearly presented without any bias too. Also very topical for me as I start to consider my own options. Does going from perm to contract in the same role instantly mean you’re inside IR35? Is there sufficient accounting ‘flexibility’ within an IR35 contract to make it financially attractive? Thanks for your comment Cossy and for your kind words. Going from perm to contracting does not mean you’re inside IR35 at all. IR35 has to do with your working practices and the contract you sign with the client. However, going from perm to contract in the same company looks suspicious to me. IR35 is definitely not financially attractive. I have never been inside IR35 to know the exact numbers but unless you get a really high rate compared to your perm equivalent, it’s not worth it. You have got great information on your blog. As a software engineer I’m thinking of moving to contracting( from perm). Can you tell me, how is possible not to be inside IR35? Could I use an umbrella company and not be inside IR35? Hi Gualter, you will not be inside IR35 if you choose a contract in the private sector. The public sector is a different beast. Some contracts are inside, some outside depending on the agency you work through. I’d say the private sector is safe until April 2020 that we will have further updates. Hope that helps! Hi Michael,Thanks for your reply. Hi Michael, great article. Saved me having to pay or subscribe to websites to get a comparison between perm v contractor. With regards to IR35, I believe it will go live to private sector in 2019. Or at least that’s whats proposed by the goverment. Looking at the rules that cover IR35, it looks like most contractors will fall inside IR35. (i.e if you are using a company to invoice your client). 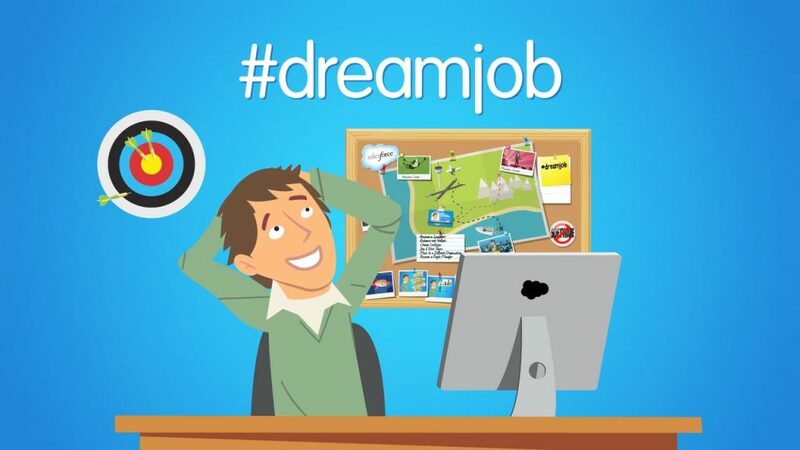 I am currently facing a choice of taking a £70k pa role or try mu luck with contracting with approx £350-400 per day. Earning approx £15k extra (using your files) definitely seems like the better option as getting a promotion from 70 to 85 will take at least couple of years. In your experience is it easier for contractor to return to perm role? or are you branded as contractor for life? Apologies for any grammar mistake as English is not my first language. Hi John, the government will not introduce IR35 until April 2020. But even that is close enough! I believe being inside or outside IR35 is more complex than invoicing directly or via agency. Mutuality of obligation, using your own equipment and acting like a real services provider are things that matter. But not even HMRC know the actual rules, simply because there are no clear-cut rules. It’s a grey area they’re still exploring. Is it easier for a contractor to return to perm role? I believe it’s quite easy yes. That’s because if you’re valuable, companies want you to stay and try to employ you permanently at some point. I had a few offers when contracting this way. As for me, I prefer to keep contracting, mainly because of my pre-tax investments through my limited company. In my opinion, this is one of the best ways to have your company money work harder for you in the accumulation phase. Good luck with your plan, John, and let me know if I can somehow help. I find myself looking for employment after being made redundant after 15 years with the same company. Never contracted and I’m the wrong side of 50, so contracting seemed like a good option to start off with, while I’m looking for my perfect permanent role. Tax returns …… never had to do one, so this scares the pants off me! On a positive note, I guess contracting could mean me spending 3 months at a time working in different parts of the country. 15 years, wow! I wonder how it feels to leave a place after such a long time. Nostalgia or anger? Or both? Contracting is not that hard to start with. And any decent accountant should be able to file your tax returns for a small fee (usually £100). Looking forward to hearing about your next journey, Natascha. Let me know if I can help somehow. Thanks for the writing, it is very helpful for me to understand about the contract and permanent job in the UK. I have been working as permanent staff in this country for 5 years (and this is my first job in the UK as well), and thinking to try the contracting job. I have more than 18 years of experience as permanent staff and I absolutely agree to what you have said about catching the big fish, career ladder, etc. Referring to what you have written above, it seems that the first step that I need to do after being offered as a contractor is to contact a trustworthy accountant, set-up my own limited company, and learn everything related about tax, particularly IR 35. Please correct me if I’m wrong – and apologize if this question seems too basic..
Hi Fernando, no question is too basic don’t worry! You are right, the first step is to find a good accountant and set up a limited company. You can also test the contracting waters first by signing up with an umbrella company instead of the Ltd/accountant model. This will probably be less tax-efficient but easier to start. I’m happy to make accountant introductions if you need any. I’m having to decide between an 85000 Euro permanent job, or contracting at 650 Euros, in Germany. Thank you for the useful write up. I am a software engineer working as a permanent employee at the moment and am on 50K PA at the moment. I have been contemplating to go contracting and a bit nervous about this jump. What makes me nervous is that do contract roles usually suit highly experienced/competent developers who need to get going from day 1? If yes, this may not be me since I am early in my career and have about 5 years of development experience. Another question, Would you recommend someone to go contracting at this point in time with the IR35 kicking in April 2020? 5 years of dev experience are enough to go for a mid-level contracting role. Sure, you will be asked to apply your expertise from day 1. But you’re already expert at something right? And as with perm jobs, there are tools that you will be given room to learn on the job. Re IR35: If I were you, I’d wait until Nov 2019 for the budget to come out first. Lots of uncertainty right now. I am now in the opposite direction. I find the waiting in between contracts too stressful, watching savings going down close to nothing left and need to start applying for permanent roles after 3 years contracting. My worry though is that a recruiter and employer may see me as a risk and not take my application seriously (ie: she will leave as soon as a good contract comes along). I am trying to think on how best to position reasons on the cover letter but am not entirely sure. Would you have any advice for me please? I’m not sure I understand how your recruiter or employer may see you as a risk and prefer contracts instead? Employers usually prefer good permanent people so that they keep the talent in the company. Also some positions are perm-only or contract-only therefore I wouldn’t see contractors as competitors. But generally, yes, contracting is more stressful plus you always need to prove yourself at interviews and at the job. I take nothing for granted and I know I can be fired in 2 weeks time. Could you please elaborate on the subject? What are the reasons employers reject you as perm but hire contractors instead? Hope you find something soon! Hi Michael, maybe I didn’t phrase it correctly and thank you for your answer! I have to return to a permanent job search as I can’t find the next contract for too long now….What do I need to say on my covering letter that I am really serious about returning permanent….recruiters will be questioning this so best to pre-empt on the cover letter so my CV doesn’t end up in the bin. In my experience, recruiters quite like contractors going perm because there are more jobs they can offer plus potentially make a higher commission. I would suggest you highlight the reasons permanent employment is good for. These are: stable paycheck, higher career goals, climbing up the career ladder, paid qualifications and benefits such as bonus and pension. But bear in mind that finding a permanent job takes more time compared to contracting. That’s simply because both you and the company make a stronger commitment and need to assess better. So keep applying and something will come up soon. Michael, sorry for my late reply and thank you for your comment, it helps a lot! 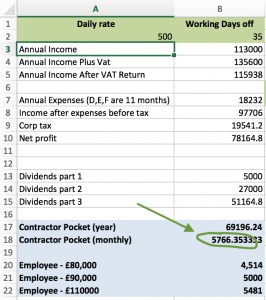 Your calculations around the dividend payments don’t take into account that by drawing the dividend tax amount out of the business, that in itself is a cost. E.g. 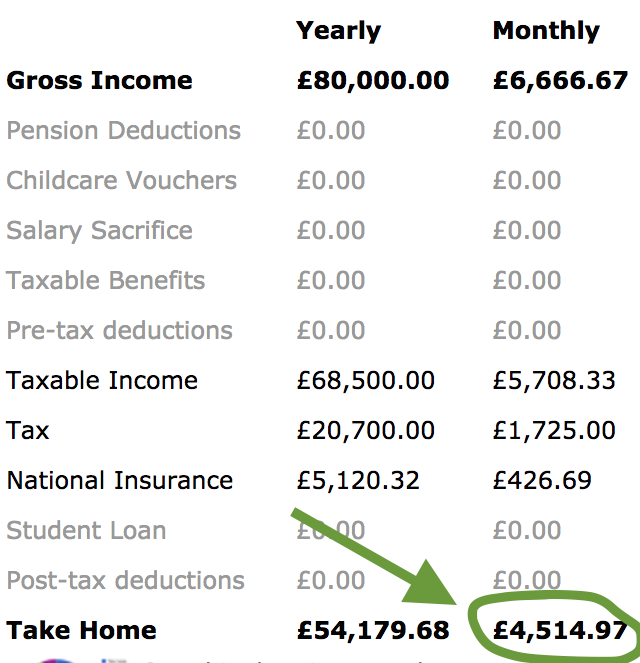 the £17000 in tax in your calc needs to come out of the business also – which itself needs to come out as a dividend. Hi Stephen, the dividend tax amount is paid by the person claiming the dividends, not by the company distributing them. In other words, it’s a personal expense not a business one and it doesn’t count as a cost.